Anyway, last Thursday evening I hung around in Sea Point after work. Took a nice long walk on the promenade and had an ice cream and read my book for a bit. Killing time before meeting Mom and Dad for dinner at The Peeb's house. We had home made gnocchi. On Friday evening I headed out to Home Bar with The Divine Miss M and some of her friends followed by a drink at Oblivion in my first attempt at a normal Friday night as a single girl. It felt super weird being out and trying to check people out. It just makes me feel sad ... I don't want to be here, stuck in the cattle car again. Yeah before I moved to Joburg I used to go out young and full of confidence, and the possibility of who you might meet made it fun. It isn't anymore. I'm old now and I no longer feel confident and I'm not interested in a random stranger ... *sob* Right, moving along, this is not helping my mood. On Saturday morning I headed off to The Biscuit Mill to meet up with a friend from work. What a spectacular day. Was so lovely catching up with her outside of the office. She ended a 15yr relationship 2.5 months ago. See, everyone is breaking up! She even said she'd noticed it too and apparently it happens in Spring. Wtf? (In other news, on FB I saw another old work-colleague of mine and her husband have split ... and they have 4 girls under 10! 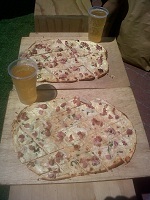 Eep) Anyway, we had a lovely wander thru the shops, and ate Flammkuchen (delish!) and drank my favourite, Eversons Cider. 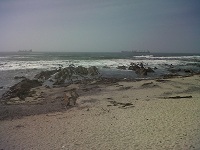 After that I headed out to Kommetjie to visit Liary and her little boy. Awe, so lovely to see them and catch-up :) It hurt a little this trip, knowing I was going to see Jam and Liary and their two babes, having just broken up with The Trucker because it's not what he wants. But meeting these 2 little people just confirmed for me what I'm looking for. And while it's hard knowing other people have already found it and made these happy little families, I know I need to keep trying. It is definitely what I am looking for. On Saturday evening I went for a last dinner with Mom and Dad to 5 Rooms at The Alphen. Wow. Just wow. The service was spectacular. And made all the more sweet by the shocking service I've experienced elsewhere while I've been in Cape Town recently. The food was also so good. We shared their Tempura Prawns to start and then I had their Springbok Duo. I thought I might have a little order envy, Mom and Dad both had the Duck. But nope, once I tasted mine I was very pleased. Highly recommend this spot for a fancy dinner out. Grabbed a quick Wimpy breakfast with Mom and Dad before I flew and then it was back to Jozi. Headed out grocery shopping before I even went home and then popped off to Lifestyle to buy some veggies for my new garden :) It is probably not the best time of year to start planting, but I am too excited. I got myself a little cherry tomato bush and some bigger tomato seeds (planted along with the seeds Daddio had already given me from his tomatoes in Cape Town). Some Butter Lettuce, which I think I've planted in too sunny a spot, but we'll see how it goes. And then a basil and mint bush (for the bunnies). 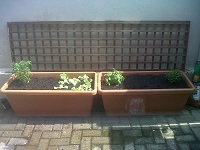 I still want to get myself some strawberries and a lime tree (which will need it's own pot). And then yeah, see how it goes. Was good to see the Bundles again, although they're not really interested in me at the moment. Had to mow the lawn which was almost knee high - haha! So yeah, had a bit of an admin afternoon just settling back in at home. And this evening it's back to Boot Camp for me ... and better eating. The eating plan and gym went pretty much out the window for December.